Peptide (C)KHEKNSTEIQT(A)R, corresponding to amino acid residues 52- 64 of rat VMAT2 (Accession Q01827). 1st luminal loop. Standard quality control of each lot Western blot analysis (unlabeled antibody, #AMT-006), and immunohistochemistry (labeled antibody). Immunohistochemical staining of perfusion-fixed frozen rat substantia nigra sections using Anti-VMAT2-ATTO-488 Antibody (#AMT-006-AG), (1:60) and Anti-TRPC3-ATTO-594 Antibody (#ACC-016-AR), (1:60). A. VMAT2 staining (green). B. 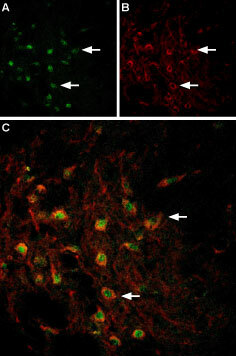 The same section stained for TRPC3 (red). C. Merged image demonstrates the ubiquitous colocalization of VMAT2 and TRPC3 in cells of the substantia nigra pars compacta. Arrows point at examples of co-expression. Bernstein, A.I. et al. (2014) Neurochem. Int. 73, 89. Weihe, E. et al. (1994) J. Mol. Neurosci. 5,149. Sudhof, T.C. (2004) Annu. Rev. Neurosci. 27, 509. Fon, E.A. et al. (1997) Neuron 19, 1271. Zheng, G. et al. (2006) AAPS J. 8, E682. Vesicular monoamine transporters (VMATs) are essential for proper monoaminergic neurotransmission, which requires the sequestration of the transmitter into synaptic vesicles by VMAT for subsequent Ca2+-stimulated exocytotic release. VMATs contain 12 transmembrane spanning domains, with cytosolic C- and N-terminals and large glycosylated intravesicular loops. In mammals, there are two VMAT isoforms: VMAT1 (SLC18A1) and VMAT2 (SLC18A2)1. VMATs primarily transport monoamines (dopamine, serotonin, norepinephrine and histamine), but also sequester toxicants into vesicles, shunting them away from cytosolic sites of action. In the central nervous system, VMAT2 is the only transporter that moves cytoplasmic dopamine (DA) into synaptic vesicles for storage and subsequent exocytotic release2. VMAT2 is expressed in monoaminergic neurons of the central nervous system (CNS) and sympathetic postganglionic neurons. VMAT2 is widely expressed during embryonic development3. Homozygous knock-out of VMAT2 in mice is lethal and heterozygous knock-out of VMAT2 in mice shows a clear gene dosage effect, with half the amount of dopamine, norepinephrine, and serotonin content in brain4. In addition VMAT2 plays a role in neuroprotection and molecules that interact with VMAT2 may have value as treatments for diseases such as Parkinson’s disease5. Anti-VMAT2 Antibody (#AMT-006) is a highly specific antibody directed against an epitope of rat vesicular monoamine transporter 2. The antibody can be used in western blot and immunohistochemistry applications. It has been designed to recognize VMAT2 from human, rat and mouse samples. Anti-VMAT2-ATTO-488 Antibody (#AMT-006-AG) is directly labeled with an ATTO-488 fluorescent dye. ATTO dyes are characterized by strong absorption (high extinction coefficient), high fluorescence quantum yield, and high photo-stability. The ATTO-488 label is analogous to the well known dye fluorescein isothiocyanate (FITC) and can be used with filters typically used to detect FITC. Anti-VMAT2-ATTO-488 Antibody has been tested in immunohistochemistry applications and is especially suited for experiments requiring simultaneous labeling of different markers. Anti-VMAT2 Antibody (#AMT-006), (for western blot analysis).